On April 29th, 2012, When Everything Was Possible - A Concert (with comments) debuted at New York City Center. 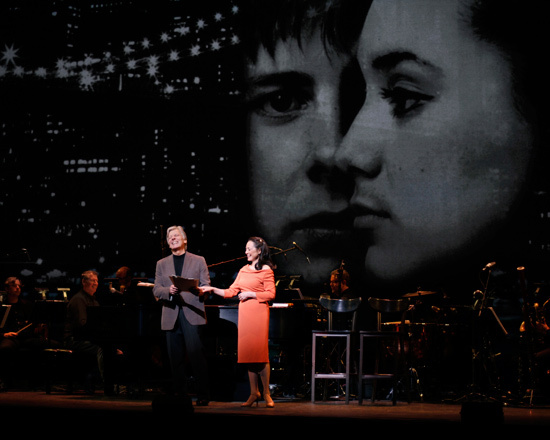 Kurt Peterson and Victoria Mallory, of the original casts of Follies and the Lincoln Center Revival of West Side Story, were welcomed back to the New York stage in a memorable evening of song and story. The show features new orchestrations by Jonathan Tunick, music direction by Michael Rafter, musical staging by Joshua Bergasse (“SMASH”) and direction by Larry Moss. They perform songs from shows they were in, including West Side Story, Dear World, Follies, A Little Night Music and Sondheim – A Musical Tribute; and debut new songs by Kurt and Jesse Wiener. The concert features images from the era’s greatest photographers – many never before on public display. “How lucky we all are to have Victoria Mallory and Kurt Peterson back together again, and sharing their musical lives with us! The personal story told and sung by these two talented artists will take some of us back, and introduce others to a rich era in not-too-distant history. Two young kids arriving in New York, who find careers that touch some of the legendary people and legendary shows, is only the beginning. What happened, both professionally and personally, is quite remarkable,” – Ted Chapin, President of the Rodgers & Hammerstein Organization, and author of Everything Was Possible: The Birth of the Musical "Follies". Following their inner music, two kids came to the biggest city in the world and went to work. They didn’t want to be famous - they wanted to be good. And in the summer of ’68, as the world flew apart, these two unknowns held court at the State Theatre at Lincoln Center, captivating audiences as Tony and Maria in West Side Story. They worked, lived, grew close, grew up, made mistakes and finally… parted. Thirty-six years would pass until they would meet again, and they found they still had a few things left to say - and sing.